The latest blistering death metal entity Of Hatred Spawn unleashed their self-titled debut album worldwide this past December on Boonsdale Records. The band’s studio and live line-up consist of JJ Tartaglia (Skull Fist) on drums, his brother Remy Tartaglia on guitars, Oscar Rangel (ex-Annihilator) on bass and Matt “Coldcuts” Collacott on vocals. The project is the first-ever collaborative offering by the Tartaglia brothers and holds great promise and expectations within the metal community around the world. Teaming up with NoCleanSinging.com, the band is premiering drummer JJ Tartaglia’s new playthrough for the album’s track “Severed Limb Convulsion”. Album order and stream available on Boonsdale Records here, Bandcamp, Spotify, iTunes. The latest blistering death metal entity Of Hatred Spawn will be releasing their self-titled debut album worldwide on December 21st, 2018 on Boonsdale Records. The band’s studio and live line-up consist of JJ Tartaglia (Skull Fist) on drums, his brother Remy Tartaglia on guitars, Oscar Rangel (ex-Annihilator) on bass and Matt “Coldcuts” Collacott on vocals. The project is the first-ever collaborative offering by the Tartaglia brothers and holds great promise and expectations within the metal community around the world. Teaming up with Bravewords.com, the band is premiering the album’s full stream. Listen to it below. Album pre-order available on Boonsdale Records here. The latest blistering death metal entity Of Hatred Spawn have announced the release date for their self-titled debut album, which will be out worldwide December 21st, 2018 on Boonsdale Records. The band’s studio and live line-up consists of JJ Tartaglia (Skull Fist) on drums, his brother Remy Tartaglia on guitars, Oscar Rangel (ex-Annihilator) on bass and Matt “Coldcuts” Collacott on vocals. The project is the first-ever collaborative offering by the Tartaglia brothers and holds great promise and expectations within the metal community around the world. Watch Remy Tartaglia shred in the band’s latest guitar playthrough for their single “Severed Limb Convulsion”. Digital and stream will be available on all major platforms as of December 21st, 2018. Advance CD copies of the album will also be made available at the exclusive album release show happening December 7th at Coalition in Toronto, ON. Full details can be found here. Announcing their signing to PRC Music, ACCURSED SPAWN will be unleashing their debut full length “The Virulent Host” next year in 2019. With a unique sound and style that stands apart from the crowd, the full length is the next step in the band’s evolution of musical expression to follows a mix of demos and EPs since 2010. “We’re incredibly excited to officially call ourselves part of the PRC family! We couldn’t have found a better partner to release The Virulent Host with, and look forward to unleashing this beast upon the world with the help of Rémi and the team at PRC!” says drummer Jay Cross. “The Virulent Host” is a fiery and passionate take on modern death metal, influenced by thrash and brutal death that stands head and shoulders above many of their contemporaries. 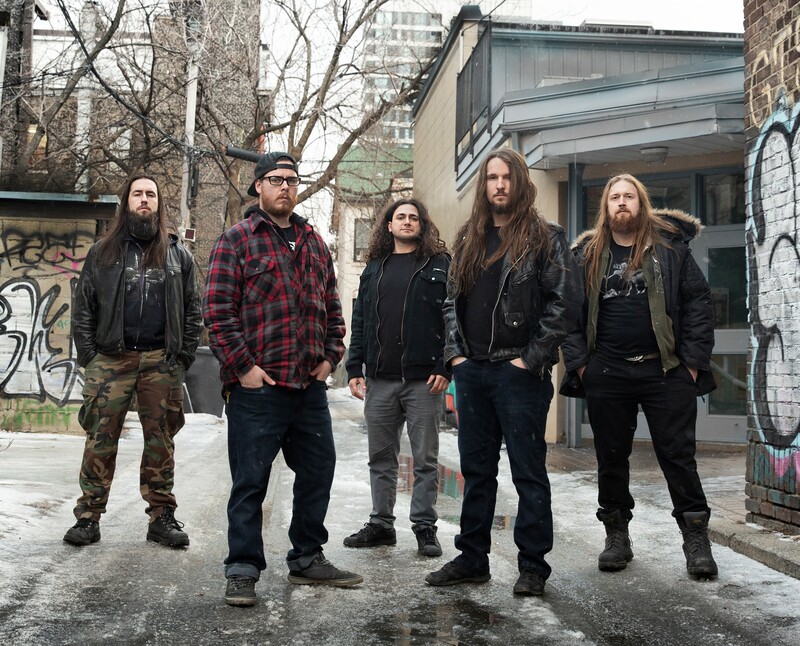 The production quality truly stands among the titans of death metal, thanks to Chris Donaldson, guitarist for legendary death metal unit Cryptopsy applying his talents and experience to mix and master the album at The Grid Studios in Montreal, QC. Donaldson has previously worked on records for high profile names such as Cryptopsy, Beyond Creation, Despised Icon, The Agonist, Beneath The Massacre, and Neuraxis. Artwork was done by highly esteemed artist Remy Cooper of Headsplit Design (Origin, Beyond Creation, Psycroptic, Pig Destroyer, Whitechapel, Thy Art Is Murder, Cryptopsy, Suicide Silence, Arch Enemy). As fans will need to wait till next year for the release of “The Virulent Host”, ACCURSED SPAWN will not let them wait too long to hear the first single off the debut. Partnering up with Decibel Magazine, the band is premiering “Bhopal ’84”, one of nine songs planned to assault fans off the album. “We want to offer an intense, yet rewarding listening experience for both musicians and non-musicians alike. Fast, dextrous playing coupled with subtly melodic compositions that can be enjoyed by both the trained and untrained ear. Out first single “Bhopal ’84” will give a good deal of insight into what people can expect from this record: it kicks off with blistering guitar and drum work, jumps into a catchy verse, and presents a very slamming bridge near the end of the song, followed by tasty solo work. It has a nice “Suffocation meets Cryptopsy” feel but is still uniquely Accursed Spawn.” adds guitarist Adam Pell.